by J Michael Waller, Perspective (Boston University), Vol. X, No. 3, February 25, 2000. Why is so little known about the KGB career of Russia’s acting President Vladimir Putin? Most reporting on both sides of the Atlantic is thinly sourced, if sourced at all, and often conflicting. Was Putin a professional foreign intelligence cadre officer whose experience abroad exposed him to reformist ideas, as many claim? If so, how was he, the first Russian leader since Andropov to have lived abroad, and the leader who lived abroad the longest since Lenin, exposed to enlightened thinking from his isolated outpost in Erich Honecker’s East Germany? If Putin wasn’t a cadre intelligence officer, what was he? Determining with which part of the KGB Putin identifies himself will help determine what shaped his professional formation and experience and could serve as a guidepost toward the direction in which he will lead Russia. The KGB was no monolith. Its sprawling bureaucracy and diverse functions employed polished spies steeped in Western ways, scholars, linguists, mathematicians, engineers, paper-pushing bureaucrats, guardsmen, and the ubiquitous thugs, snoops and dissident-hunters that formed the core of the KGB ethos. The dearth of hard facts about Putin’s KGB career and the official silence, combined with the Andropov-style myth-making about Russia’s new leader (alleging him to have been everything from a quiet monitor of pro-glasnost’ East Germans to a Russian James Bond who recruited hordes of Westerners), indicate that something about Putin’s KGB past is hidden. We knew as much if not more in 1990 about Soviet KGB Chairman Vladimir Kryuchkov’s intelligence career than we know in 2000 about Putin’s. One must conclude that Putin has something to hide. 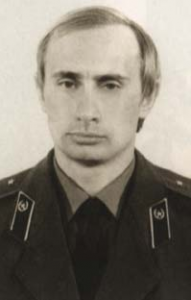 This suggests that whatever he did in the KGB was not standard intelligence collection or agent operations–which continue to be held in high esteem by most Russians–but something that would offend even the very public that backs his campaign of “liquidation” and “extermination,” in his words, of the population in Chechnya. That narrows things down to two: domestic spying/political repression, and involvement in illicit “economic operations.” Based outside the USSR in East Germany, Putin presumably was a cadre officer in the First Chief Directorate, the most prestigious part of the KGB that was spun off and renamed the External Intelligence Service (SVR) in 1991. That being the case, he would have been far removed from repression and from the domestic political spying that continued through perestroika. Kryuchkov did not specify which part of the KGB commissioned Putin, but he indicated clearly that it was outside the First Chief Directorate. Lawyer-administrator Putin was unlikely to have been an officer in communications and cryptography, border troops, operational-technical work, guards or signals intelligence. He could have been with the counterintelligence chief directorate, the economic counterintelligence directorate, or the surveillance directorate, but why he would hide such connections is unclear. Or he could have been attached to the KGB’s rather mundane administrative units. While the First and Fifth Chief Directorates in the glasnost’ period sought out Communist leaders in Soviet bloc countries who supported Gorbachev-style reforms, the Fifth was also at work in the region on another project, as East Germany’s Gauck Commission discovered. The Interlinked System for Recognizing Enemies was a KGB operation to monitor anti-Soviet political dissent in East Germany and elsewhere. We have few details about how the Interlinked System for Recognizing Enemies actually worked, but the name alone suggests it was not a glasnost’-type of operation. Its modus operandi that Gauck described and the consequent KGB liaison with the political police divisions of bloc security services indicate involvement of the Fifth Chief Directorate. Leonid V. Shebarshin, a deputy chairman of the KGB from 1989 to 1991, says it is quite likely that the KGB “sanctioned” Putin’s move to Sobchak’s office: “What Putin was doing in his work in the Leningrad administration naturally was of some interest to the service.” The KGB, Shebarshin said, “was interested in having its own man in the administration.”(17) There, Putin earned the nickname “Stasi”(18)–not a name likely to be conferred on a foreign intelligence officer, but a fitting one for a political enforcer. Putin has a point. But he misses the far larger point: The Soviet Union and Communist Party are gone and discredited though not entirely missed, while the chekisti and their entire cultlike devotion to their Bolshevik terrorist heritage, as Putin himself manifested in his 18 December speech to the security officers and his reluctance to criticize the Stalin era, remain a fundamental part of Russia’s state security culture. Less than two weeks after becoming acting president, Putin decreed the creation of what Segodnya called a new “super special service” to merge sections of the FSB and elite police units. Few gestures could express his mentality more vividly: One of the first orders of government was to grant more and more power to the secret services. This new security organ, apparently intended to root out official corruption, was just taking shape as this article was written. Nikitin is the most prominent example of the harassment and persecution environmental activists have endured in recent years, a development which began long before Putin entered the Moscow scene. Another prominent case is Grigory Pasko, another former Navy officer who spent 20 months in prison until his release last July. However, Putin embraced the campaign against those seeking to discover and clean up nuclear waste. Apart from involvement in political repression, the only other activity in Putin’s past that could undermine his public appeal are claims that he had a hand in illicit “economic operations.” Curiously, he has been at the epicenter of such actions at every major post he has held since serving in East Germany. However such allegations are hard to verify. Dresden was the second-largest East German city for the illegal stripping of state resources and laundering of hard-currency proceeds to the West, and Putin had his finger on the pulse. Some reports link Putin to the Coordinating Committee (Ko-Ko), the East German Communist Party organ that actually ran the resource theft, sale and hard-currency laundering operations. At the very least, Putin could have seen how the operation worked firsthand–a valuable experience for any Russian corruption-fighter (or his antagonist) who could see exactly how the pillaging system worked. Putin became Sobchak’s main protector. When Sobchak himself faced corruption charges in 1996, Putin reportedly participated in arranging his flight to France on a chartered Finnair jet. (33) Sobchak did not return to Russia until Putin became prime minister. After Sobchak’s departure, the Kremlin tapped Putin. Albats reports that, contrary to popular perception, economic reform chief Anatoly Chubais was not the one who brought Putin to Moscow. Presidential property chief Pavel Borodin, she writes, hired Putin because he needed “assistance in overseeing the Kremlin’s extensive foreign economic assets, mostly in the former Soviet bloc.” Putin’s East Germany experience made him the right candidate. (34) Borodin would become Putin’s second consecutive boss to fall amid credible corruption allegations–in Borodin’s case, in association with the Mabetex affair in which Swiss authorities issued a warrant for Borodin’s arrest. By that time, however, Putin had been promoted. With Chubais’ support, he became an aide to Valentin Yumashev, next to Yel’tsin’s daughter Tatyana Dyachenko, in charge of the “oversight department” to enforce loyalty among bureaucrats and regional governors across the Russian Federation. (35) Putin was now a member of The Family–a loyal protector, not a corruption-fighter. In 1998, Putin became director of the FSB. One should expect a degree of economic reform under a Putin regime; few dispute the need if Russia is to recover. One should also expect some aggressive prosecutions of high-profile figures on corruption charges. They will, in all likelihood, be more political moves than honest corruption-fighting, just as the Cheka used the corruption epithet to smash its “class enemies,” or as Andropov employed the KGB selectively to expose corruption to undermine his Brezhnevite rivals. Any other way simply is not part of Putin’s chekist genetic code. 1. Yevgenia Albats, “Power Play: Does a KGB Resume Make Putin a Stalin?” Moscow Times, 13 January 2000; Bill Powell and Yevgenia Albats, “Who is Vladimir Putin? A Look at His Rise to Power,” Newsweek, 17 January 2000. 2. Michael Wines, “Putin Once Decorated as Spy, but Few Agree on His Deeds,” The New York Times, 10 January 2000; and Martin Woollacott, “Russia’s New Boss Has an Extremely Strange History,” The Guardian (London), 7 January 2000. 3. US intelligence sources interviewed by the author, January 2000. Stratfor.com issued a similar assessment. 4. Christopher Andrew and Oleg Gordievsky, KGB: The Inside Story (New York: HarperCollins, 1990), p. 621. 6. Victor Yasmann, Radio Free Europe/Radio Liberty. 8. Michael Wines, “On Top, Still a Mystery: New President for Russia,” The New York Times, 1 January 2000. 10. Vladimir Kryuchkov, interview in Moskovsky novosti, 25 January 2000. 11. Victor Yasmann, interview with author. Yasmann expands on this in a forthcoming Radio Liberty paper. 12. Jozef Darski, “Police Agents in the Transition Period,” Uncaptive Minds, Vol. 4, No. 4, Winter 1991-1992, pp. 15-16; and Joachim Gauck, interview with author. 13. J. Michael Waller, Secret Empire: The KGB In Russia Today (Boulder, CO: Westview Press, 1994), p. 90. 14. The most prominent is Gen. Viktor Cherkesov, a KGB First Chief Directorate officer in Leningrad/St. Petersburg. Former dissident Georgy Mikhailov and others tell the author that Cherkesov personally interrogated and persecuted them for their activities in the 1970s. As of this writing, Cherkesov is first deputy director of the Federal Security Service and is likely to head a new internal security apparatus that Putin is developing officially to fight corruption, and unofficially to extend political control into the regions. 15. Putin’s official resume is posted on the Russian government web site at http://www.government.gov.ru:8080/government/minister/index.html. 17. Richard C. Paddock, “The KGB Rises Again in Russia,” Los Angeles Times, 12 January 2000. 18. Andrei Piontkovsky, “Stasi for President,” Russia Journal, 17-23 January 2000, citing former prime minister and former St. Petersburg internal security chief Sergei Stepashin. 19. ITAR-TASS, 19 December 1999. 20. Helen Womack, “Putin’s Rivals Fear He Is Leader of KGB ‘Silent Coup,’” The Independent (London), 5 January 2000. 21. ITAR-TASS, 18 December 1999. 22. Arnold Beichman, weekly column in The Washington Times, 10 January 2000, citing Novaya gazeta and Obshchaya gazeta. 23. Reuters, dispatch from Moscow, 6 January 2000. 24. David Hoffman, “Putin Steps Out of the Shadows,” Washington Post, 30 January 2000. 26. Lori Montgomery, Knight Ridder dispatch from St. Petersburg, 9 January 2000. 27. Geoffrey York, “Green Activists Face Crackdown in Russia,” Toronto Globe and Mail, 27 October 1999. 28. Thomas Nilsen, “More Media Lies About Environmentalists,” Bellona Foundation (Oslo) website, 16 December 1999; http://www.bellona.org. 30. Ibid., citing Komsomol’skaya pravda. 31. Inna Rogatchi, “Putin and His Shadows,” Ilta-Sanomat (Helsinki), 1 February 2000. Translation provided by Rogatchi. 32. Oleg Lurye and Inga Savelyeva, “Putin: Four Questions for the Heir to the Throne,” Versiya, 17-23 August 1999. 36. The Independent, 17 November 1999. 37. Monitor, Jamestown Foundation, 17 November 1999. 38. Philip Sherwell and Tony Paterson, “Putin Accused of Blackmail Plot to Defend Yeltsin Family,” Daily Telegraph (London) 16 January 2000. 39. Sergei Kovalev, “Putin’s War,” The New York Review of Books, 10 February 2000.